Apologies for not posting sooner — I’ve just returned from vacation in Las Vegas. 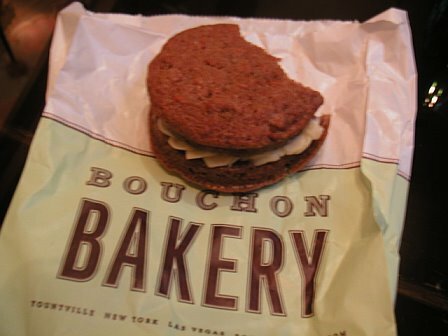 It has been nearly two months since my first experience at New York’s Bouchon Bakery, so while vacationing in Vegas, I thought it only appropriate to pay a visit to the Las Vegas outpost of the bakery, located in the Venetian. I only had a minute to stop by, so I grabbed the ham and cheese baguette and carrot cake on the way out. The ham and cheese baguette was the best I’ve ever had. It had been briefly toasted, and the baguette’s crisp, warm exterior gave way to a soft interior. The ham wasn’t too salty but wasn’t at all lacking in flavor; the semisoft, Swiss cheese was mild. I could taste mustard and the slightest creaminess of mayonnaise, just enough to enhance the flavors of the ham and cheese — exactly the way condiments are meant to be used. I don’t like traditional carrot cake, but tried the carrot cake that Andy purchased anyway. The cake was a twist on the sandwich cookie, with the icing was the filling, sandwiched by two cake “cookies.” Neither the cake nor the icing was cloying, and the batter had a rich orange peel and nutmeg flavor. I actually found it to be mildly enjoyable. I’ve attached a blurry on-the-run photo of the carrot cake, but I was too hooked on the sandwich to even stop to take a picture of it. Honestly. This entry was posted on December 28, 2007 at 10:14 pm and is filed under Destinations, Restaurants, Reviews with tags Las Vegas, Thomas Keller. You can follow any responses to this entry through the RSS 2.0 feed. You can leave a response, or trackback from your own site. Did you ever see this post?